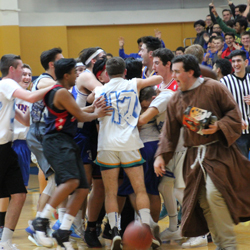 Serra's deeply-rooted tradition of Padre spirit is alive in our current students and alumni. 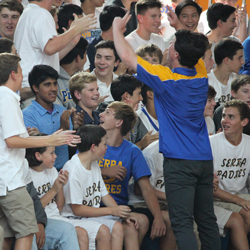 Serra yell leaders are committed to inspiring the Serra community at rallies and games. 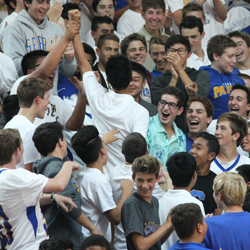 Step into the Serra gym during a high-energy rally and you'll be amazed by the astonishing school spirit and sea of blue and gold! What better way is there to embrace the freshman class and welcome the student body back from summer vacation than the traditional Welcome Rally? 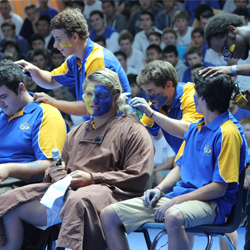 Members of the Serra Executive Council host this popular event and welcome the freshmen to the Serra brotherhood. Back in the day (1954 to be exact), the city of San Jose consisted of many prune orchards. It just so happens that Serra's longtime rival, Bellarmine, is located in San Jose. The Padre football team had not defeated Bellarmine, and Team Captain Jim Jackson '55 knew that something needed to be done. He requested that a special rally be held, so that the football team could show the rest of the school how they were going to "squash" Bellarmine. Thus began the squashing of the prunes in what now has become the traditional Prune Rally. The '54 team not only beat the Bells, but went on to an undefeated season–the last team in school history to do so. For more than 40 consecutive years, the Jungle Game has appealed to the entire Serra community. The most anticipated event of the basketball season draws sell-out crowds, excited fans and passion on both sides of the court. Basketball players from San Francisco, who drive down to the Peninsula for the match-up in Serra's gym, are greeted with palm fronds that adorn the bleachers and walls, an amped-up, deafening cheering section, and a basketball squad that is ready for jungle warfare. The Jungle Rally is a perfect way to get us pumped up for the always exciting match up between the Serra Padres and the SI Wildcats!